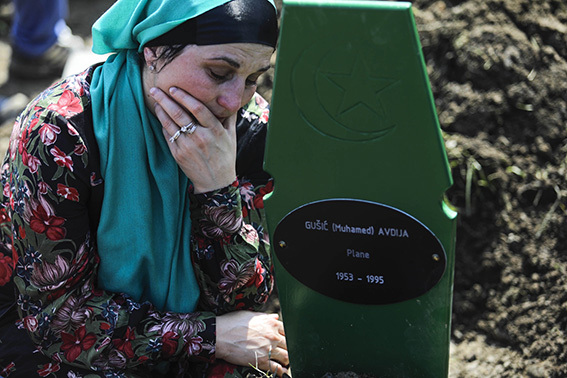 Thousands of Bosnian Muslims gathered in Srebrenica on July 11 to bury 35 newly identified victims of the Srebrenica genocide to mark the 23rd anniversary of Europe’s worst genocide since World War II. The victims’ bodies were exhumed from mass graves in the eastern Bosnia and Herzegovina’s village of Potočari, northwest of Srebrenica. The victims buried include four teens between 16 and 17 years of age. The youngest victim is Vesid Ibrić, 16 while the oldest is Sahin Halilovic who was 71 when he was killed. A young woman, 20-year-old Remzija Dudić who was 6-months pregnant was also buried. A truck carrying the remains of the newly identified victims passed through the capital on its way to the Srebrenica Memorial Centre in Potočari where the bodies join 6,575 other victims who lie buried at the memorial. The truck left from a morgue in the central Visoko, where members of the victim’s families had gathered to see their loved ones take their final journey. Nermin Alivuković, head of the Organising Committee for Memorial Activities of the Srebrenica Genocide, said that some criticise them for spreading information about what has happened in Srebrenica. “These days on the eve of the 23rd anniversary of the genocide, we are criticised as if the persecution in Srebrenica should no longer be talked about. They should know that as long as the relatives of the victims are alive, the sad experiences will continue to be told,” he argued. Elsewhere, hundreds of motorcyclists from across Europe held a procession from the country’s capital Sarajevo to Srebrenica to commemorate the victims. The procession with the slogan ‘We did not forget, we will not forget’ passed through Sarajevo’s streets, attracting interest from locals. More than 400 bicyclists from across the country also gathered in the northern city of Bihac to honour the victims. On July 11, thousands of people from all over the world set off on a three-day commemorative peace march in the town of Nezuk near Tuzla. More than 6,000 participants travelled about 22 miles each day to reach Potočari, spending the nights at designated wooded areas. Nearly 170 identified victims are in the Podrinje identification centre in Tuzla, but largely due to incomplete remains the victims have not yet been buried. Srebrenica was besieged by Orthodox Christian Serb forces between 1992 and 1995 during the Bosnian War. Serb Christian militias were trying to wrest territory from Bosnian Muslims and Croats to form their own state. The UN Security Council declared Srebrenica a “safe area” in the spring of 1993. However, Serbian troops led by General Ratko Mladić, who now faces genocide charges in The Hague, overran the UN zone despite the presence of around 450 Dutch soldiers tasked with acting as UN peacekeepers. The Dutch troops failed to protect the Muslims as Serbian forces occupied the area, killing about 2,000 men and boys on July 11 alone. Some 15,000 Muslim men and boys of Srebrenica fled into the surrounding mountains, but Serbian troops hunted down and slaughtered 6,000 of them in the forest.